Hypothetical Science ADV “STEINS; GATE” is a spin-off game and Hypothetical *Second-grade Syndrome x ADV “STEINS; GATE Hiyoku Renri no Darling” has finally been released for iOS! ※Compatible with iPhone5 or later, iPod touch 6G and iPad4G,iPad mini2 or later. 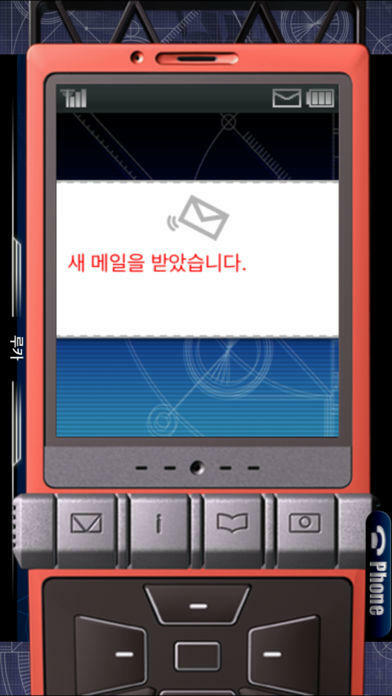 ※This game is only available in Korean. This story may be real? This is the story of the Future Gadget Laboratory members. Want to play more Hypothetical Science ADV STEINS; GATE games? Why not try STEINS; GATE’s new slapstick comedy Hypothetical Second-grade Syndrome, which has finally been released! The concept has changed compared to the previous dramatic story, as the game depicts the daily romantic lives of lab members, often with comedic effect! The game is not only a slapstick comedy, but also includes many sweet and romantic scenes! This spin-off game gives users the same thrilling experience and those who played the previous game will be able to take on the new challenge! 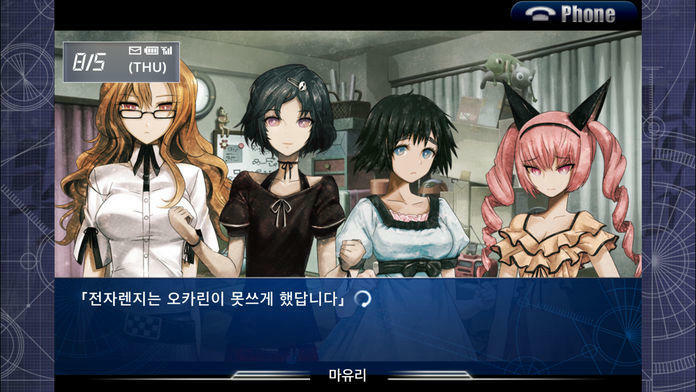 * A romantic and comedic adventure game with the characters from STEINS;GATE! *Phone trigger system optimized for iOS! The story changes depending on your preferences! *Appear as six characters (including one male character) with individual endings for each! *The game has more than 20 hours total playing time! * You can enjoy this game on either iPhone or iPad as a Universal app! *Saved data is stored on iCloud! Play with different devices and share the saved data! Swipe down the left side of phone trigger: Close phone trigger. Choose BACKUP from the SYSTEM on the title screen, and then you can backup the saved data to iCloud. Rintato Okabe, commonly known as Okarin is a University student, who is still stuck in *Second-grade Syndrome. He introduces himself as a mad scientist named Kyoma Hououin and he spends most of his time doing odd research with several members of the Future Gadget Laboratory, which is commonly called Lab. They accidentally find an invention, “D-mail,” which can send emails to the past. 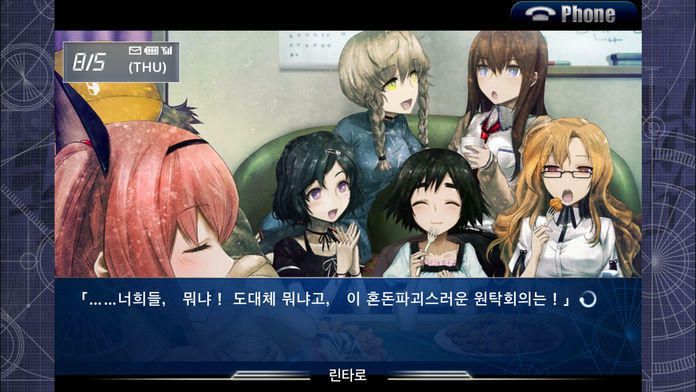 One day, Okarin finds the lab members busily arranging a celebration party for a newly completed gadget. But, why have they produced a new gadget while Okarin doesn’t know anything about it? The number of lab members has increased from six to eight. It seems that they have changed the past with the D-mail inventions. What’s more, due to the D-mail inventions, the electric bill has gone up immensely. Creating a cash flow problem for the lab. Therefore, in these circumstances the members plan to sell a new gadget to solve this financial difficulty. *Second-grade Syndrome most commonly appears in the second year of junior high school (around 14years old). Symptoms include extremism, audacious behavior and hyperactivity, similar to mental illness. This syndrome occurs during adolescence. * Required iOS version has been raised to iOS 10 and later from this version. * The copyright notation was changed.